It was a good day for much of the overseas contingent at Busan. So good, it’s hard to know where to start. Let’s start with the newcomer. Thomas Gillespie joined the training ranks at the south-coast track in June and has put together a string numbering 23 in total. Today he sent out his first runner. Indeed, Mangang (Creek Cat), who was returning from 10 months away from the track, was to be his only runner all weekend. Punters spotted it a mile off and duly sent Mangang off as the favourite. Under Masa Tanaka, Mangang duly obliged but it was very tight with the gelding just getting up to overcome Pico Taeyang and hold off the fast finishing Big Echo by a neck on the line. May it be the first of many for Gillespie but it wouldn’t be the only close finish of the day. Gillespie joins two other foreign trainers at Busan. Peter Wolsley evidently took the day off but South African Bart Rice was in fine form. Rice only sent out four horses all day but three of them returned winners. 10/1 shot Gold Bank (Bernstein) crept down the rail under Masa Tanaka to win race 11 before You Hyun Myung guided favourite Captainiji (Mineshaft) to the honours in race 13. It was quite a bizarre ending to the race with jockey You taking Captainiji down the rail – which had been the place to be all day – while his closest rival Last Ticket shifted well wide only to fly home and be beaten a neck on the line. It was Captainiji’s second consecutive win over 1800M. Rice wasn’t done. Race 14 saw his Alpha Plus (Biwa Shinseiki) get sent off at 8/1 but in the hands of Masa Tanaka, he defied those odds to land a comfortable 5-length triumph. Bart Rice has now seen six of his last ten runners return home as winners. Since he started in Korea, his win strike rate is 18%; 27% of his runners have finished in the top two while he has managed to get 33% to show. He is currently 14th of 33 trainers in the 2015 Championship in terms of winners but has sent out significantly fewer runners than any other trainer on the list. Except Thomas Gillespie. It is this care for his runners – that he sends them out only when they are right – that has made Rice the trainer of choice for some of the new foreign owners at Busan. Dr. Joe Dallao, the first foreign owner to be licensed, has two with him and he in turn introduced Barry Irwin, head of Team Valor (owner of 2011 Kentucky Derby winner Animal Kingdom), who has sent his gelding Swoop to Bart’s barn. It’s time to talk about Masa Tanaka. In between getting Mangang home for Thomas Gillespie and his double for Bart Rice, the Japanese rider also had time to get the best of a desperately close finish to race 4 on Grageo (Biwa Shinseiki). He coaxed the 8/1 chance into beating the favourite Seorabeol Gongju by a nose on the line and it was one of those instances where the jockey made the difference. It was Grageo’s second win. 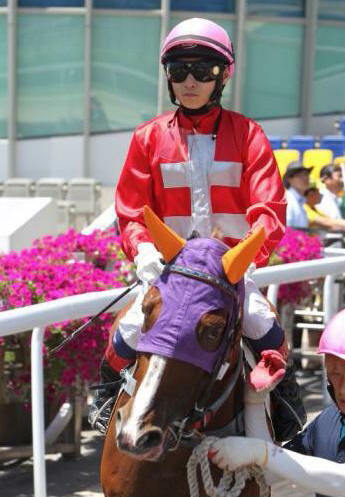 His first was on his racecourse debut back last Boxing Day when he was ridden by Tanaka’s Japanese compatriot Joe Fujii. Fujii won just about every big race during his time in Korea while Tanaka is yet to win a Stakes but that doesn’t tell the whole story. He’s now racking up the numbers and with his four victories today moves onto 84 Korean winners and his stated aim of reaching 100 will surely be a formality. Tanaka is a very good judge of pace who gets his mounts into exactly the right positions and given the right ride in a big race, there is no doubt that he will get the job done. Held in high esteem among punters and connections alike, it’s hoped he will be here for a long time to come and will soon reset his ambition to 200 winners. On the subject of getting the job done, we turn to Ikuyasu Kurakane. The Seoul Racecourse “MVP” of 2014, despite not winning the Jockey Championship (for a foreigner at Seoul that is an immense achievement), returned to Korea last week after five months riding at his home track of Kochi in Japan. It didn’t take him long to get back in the winner’s circle as he partnered Rising Bravo (Discreet Cat) to victory in race 6. The “Punter’s Friend” is back. Peter Hill’s Pegasus Stables on Jeju Island has been a big supporter of Bart Rice and has also sent some horses to Thomas Gillespie (and previously to Peter Wolsley too) and to round out a good day for the foreign influence, the Pegasus owned Binggoragio (Blazonry) was the 20/1 winner of the final event on a long day, race 15. All in all it was a cracking day’s sport at Busan. The foreign influence; the South African track riders, the trainers and the jockeys have played an important role in making Busan far superior to Seoul when the two tracks race their horses against each other. 32,000 punters were at Seoul today to bet solely on Busan. In Gillespie, Rice, Tanaka and Kurakane, they were betting on quality.